Happy Monday! I hope you all had a great weekend, and enjoyed watching the Super Bowl (or at least the commercials!). We had a busy weekend with basketball, tile shopping, and I worked on a little project for Emmy as well. Oh, and I am SOOOOO flippin’ excited about the tile I chose from The Tile Shop for the kitchen backsplash. Want to see? It’s the dreamiest, prettiest recycled glass tile and it reminds me of the ocean! The tile and she shelf are the last pieces of the kitchen to be put in place! Since we are getting close, I figured it was about time I shared my island with you. 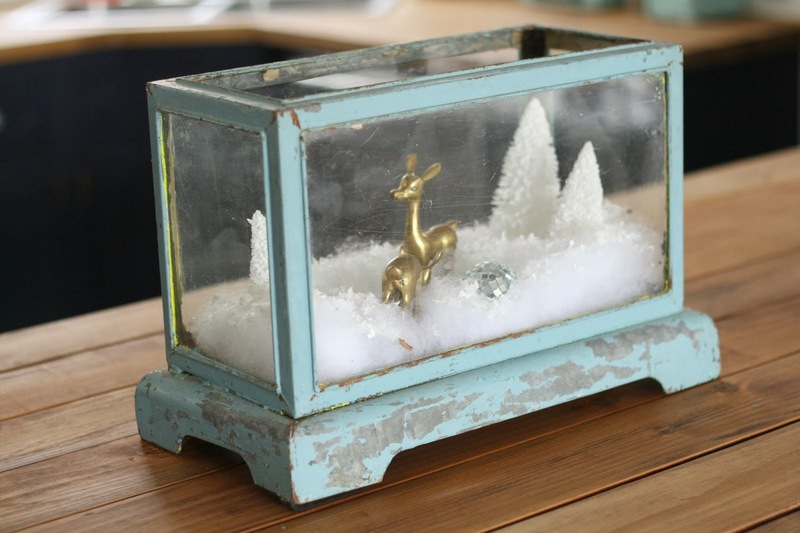 You’ve seen glimpses in my Fall and Christmas home tour, but today is all about the island. My neighbor, the talented Travis Bruns (who can be reached via email at twbruns@gmail.com should you wish to work with him on a custom piece of furniture), created it for me based on the measurements and inspiration pictures I showed him. He brought it over to the house in two pieces as we couldn’t fit it through the door otherwise. Because it is a big piece and needed to be brought in pieces, I finished it in place, just being careful not to make a mess. Here is what it looked like upon arrival to me house…. As you can see, originally I thought I wanted the stools on the kitchen side so they could face the beautiful view we have, but I changed my mind. I got to work immediately on the base first. I gave it a base coat of Duck Egg Chalk Paint as I wanted a hint of color showing. I then applied two coats of The Old Fashioned Milk Paint’s Oyster White Safe Paint. 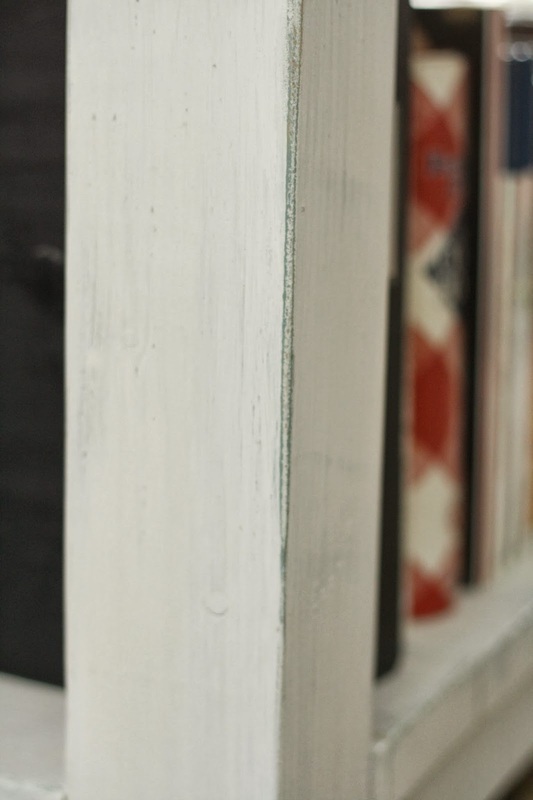 Why Safe Paint instead of regular milk paint? 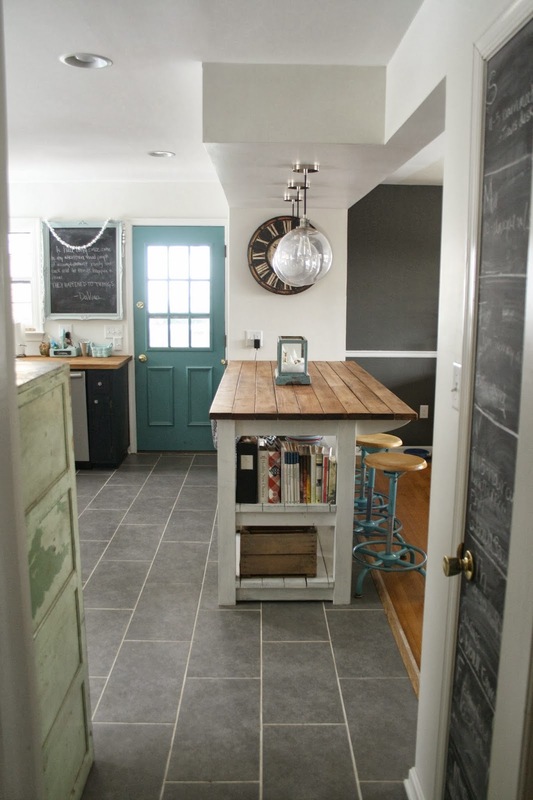 It has a smoother more consistent finish over large areas, and this island is rather large! I thought it was the perfect choice. Once it dried, I sanded all of the edges, and lightly all over to expose some of the Duck Egg beneath. I finished it with a coat of Briwax from Rockler in clear and buffed it to a smooth finish. It was looking good! It looked so pretty, but in my heart I knew I had messed up and needed to fix it. I got to work with 0000 steel wool from Rockler and odorless mineral spirits. I gave it several washes with the mineral spirits until I was satisfied that it was not going to just scratch off anymore. Once I got it to that point do you know what happened??? I LOVED IT. 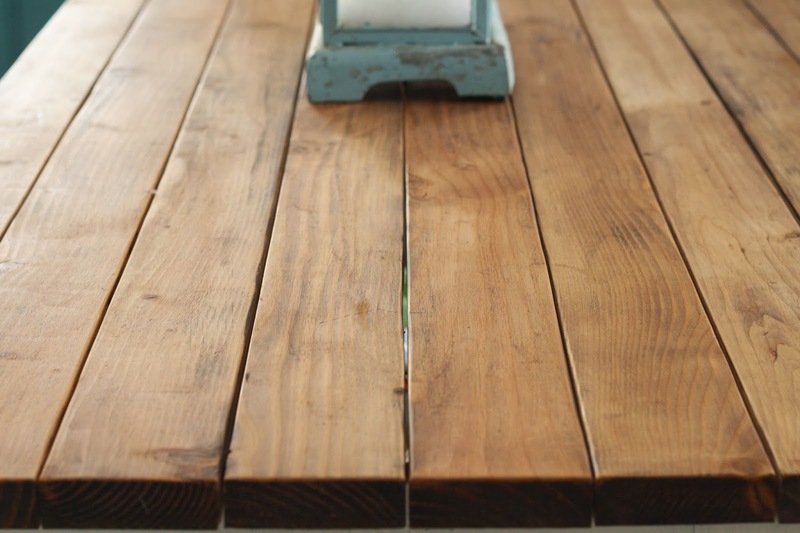 The dark stain had settled into grooves of the wood and it had a cool rustic look. I gave it a final clear coat of Briwax, buffed it, and was done! Every now and again if I think it needs it, I give it some oil or wax, as we use it all the time. So, now are you ready to see the final product? And here is a closer look at how the top turned out after my mess-up. 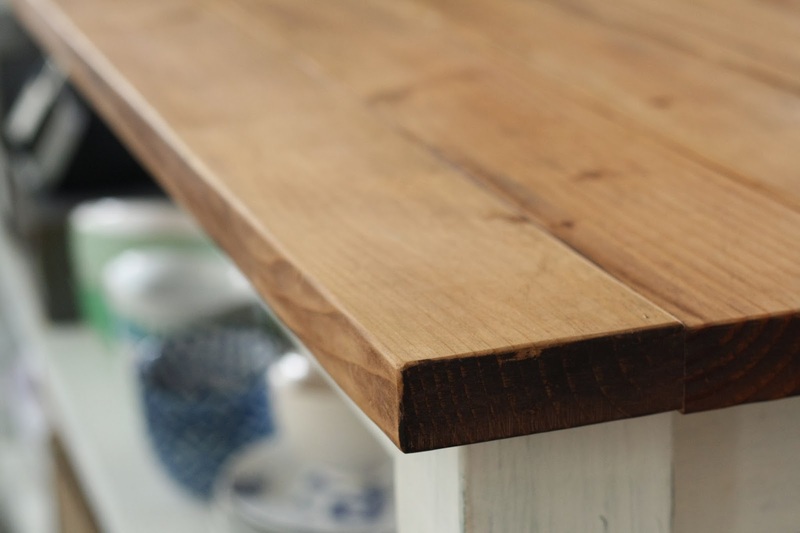 I love how the dark stain ended up creeping into the grooves, and the overall feel is rustic and warm. And the base is soft and pretty, lightly distressed. It provides such amazing storage. 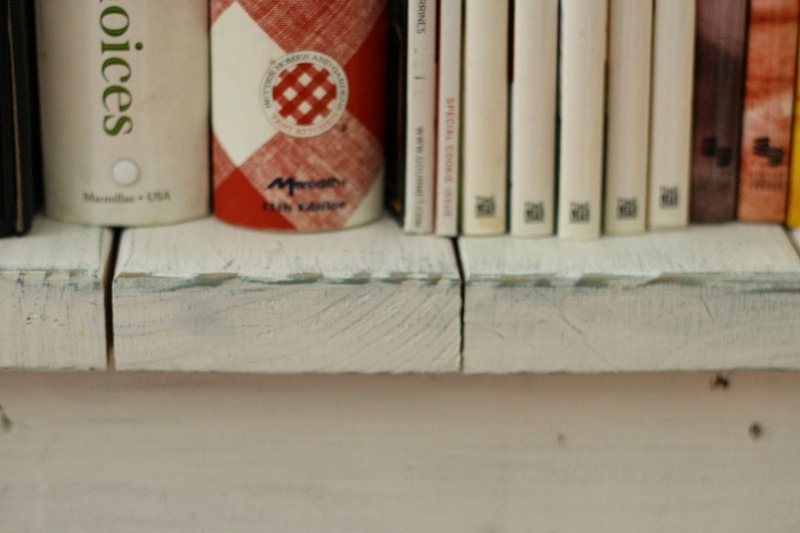 At the end, I keep all of my cookbooks on the top shelf. The lower shelf houses recipe boxes hidden in a vintage crate. 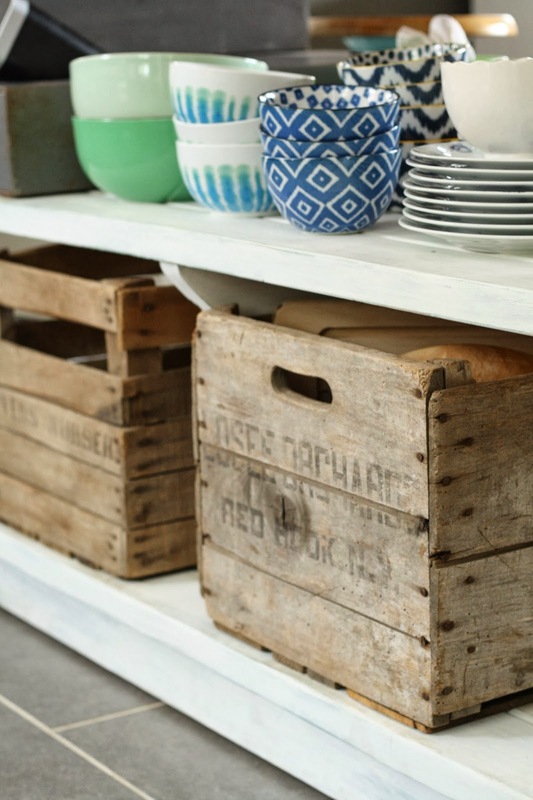 The crates on the lower shelf also hide essentials like cutting boards and our salad bowl. 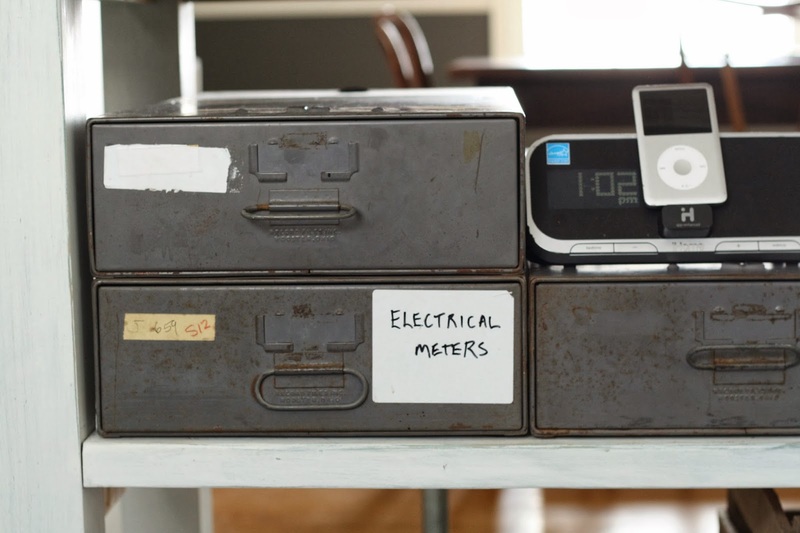 I found these vintage industrial drawers which appear worn and old on the outside but were super clean on the inside! I purchased utensil dividers and these house all of our silverware. And of course, I like to dance around my kitchen, so the ihome is a must! 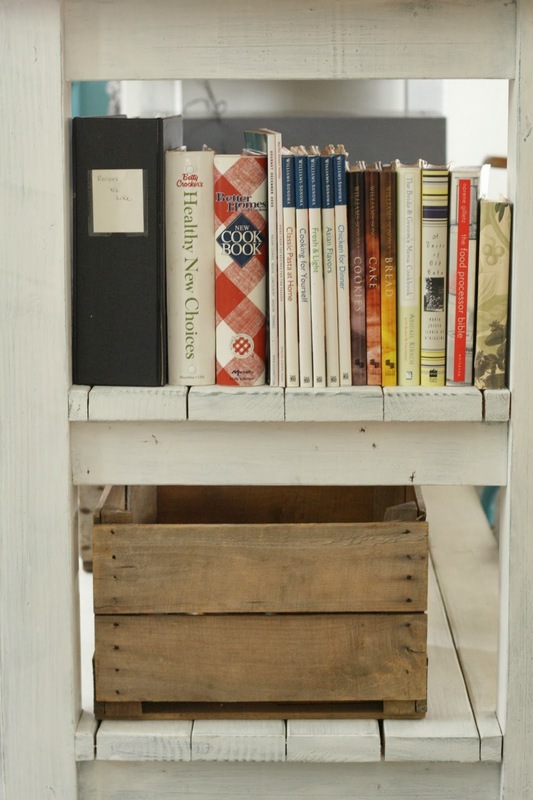 And then of course there are the amazing stools I purchased from one of our Sweet Clover vendors, Charm City Farmhouse. I am trying to tie them in more with the backsplash and really play up the color! And there you have it…. I hope the island reveal was worth the wait! Have a great Monday…. we have a snow day. AH-gain. Over it. Cassie mistakes are meant to happen! And clearly this one is for good reason, part of the learning curve and you’re right, a lovely finish to show for now. Yummy. LOVE, LOVE, LOVE your custom island. No one would ever know you messed up on the top. It looks perfect to me. I’m digging all your dishes. That tile is going to be so awesome in your kitchen. I remember what your kitchen looked like and you sure have come a long way! Wow! Love it all! Isn’t it great when a mistake turns into something gorgeous? You did an amazing job, and the island is just perfect! I’m smitten with those stools too, never mind that backsplash!! So much fun to watch it all come together! Such a thing of beauty. I love that island. I so wish we had room for an island! I like the way you have it facing. It feels like it was always supposed to be like that. I extra love those juicy dishes! I love it so much Cassie! It fits perfectly in your kitchen and I love how you have your cookbooks and dishes stored underneath. Also, can’t wait to see your kitchen backsplash installed. It’s gorgeous! I love it so so much and can’t wait to see the tile go up. The island is such a show stopper. It all turned out so perfect! I love the new tile, wish I could have used something like that in my kitchen too! The kitchen is really looking wonderful! I’m glad to hear you are actually human and not a robot. This week appears to be starting right. I LOVE your kitchen. It’s perfection. I can’t wait to see this tile business! 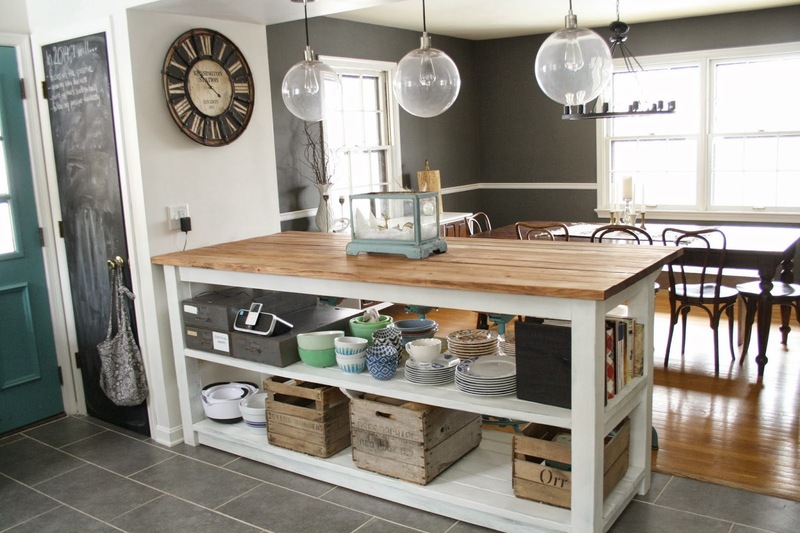 I was thinking of using my outdoor farmhouse table as my island but kept pushing that thought to the back of my mind because I didn;t think it was practical. How would it look etc. Well, you have shown me that it can be done and done well. Often my best re-dos have come out of my greatest screw-ups. So cheers to screw-ups!! Looks soooo nice! Love the all the blue touches. Absolutely gorgeous! I love it all! That backsplash is going to be beautiful! The island is amazing and I love how the mess up made it better! Always a great feeling when an oops turns into something you love. The color is great and it obviously is super functional too! I just wish all my mess ups turned out as excellent as yours! In love! It’s so pretty, Cassie! I love the island! 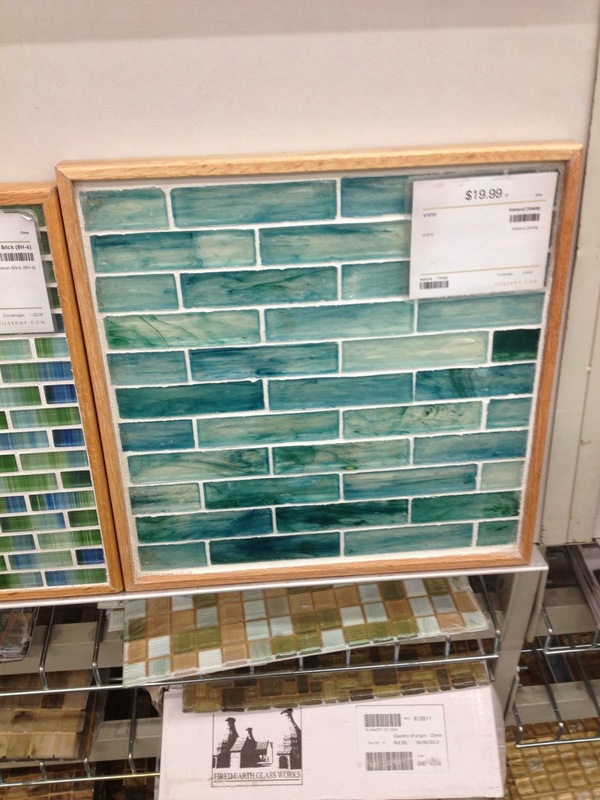 Also, the tile you picked is perfect! I can’t wait to see the finished product. What a great island! I love the open shelving on the bottom and ultimately the top came out beautifully. 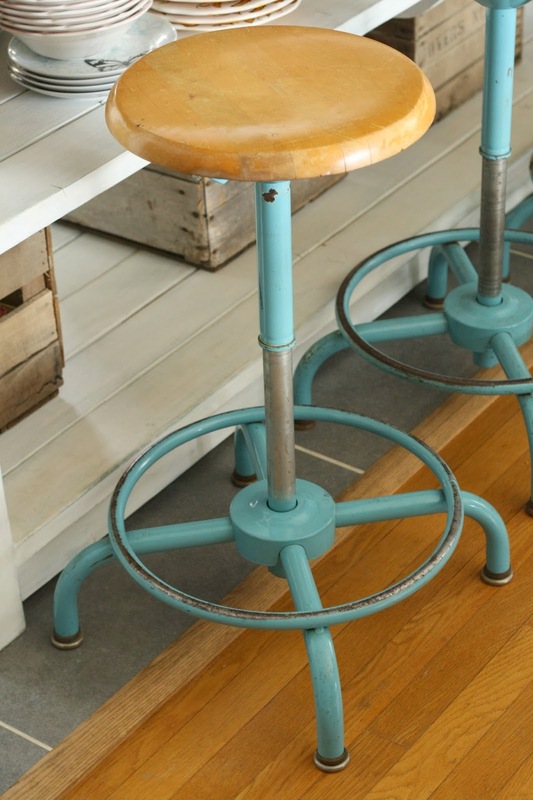 And the turquoise pops of color are so pretty – so jealous of those stools. And those tiles will be just gorgeous! … Happy snow day, again! I love everything about that island!! And your eclectic mix of things on it. Perfection! Your kitchen has come a long way! The island is great; I love the cool storage you have added to the shelves. It looks outstanding in your kitchen! You and your neighbor both did a great job on it. Love those “cool” stools too. It’s beautiful Cassie. You’re kitchen (and whole house for that matter) is really coming together. LOVE the stools! It’s SO good, Cassie! I love it when you learn something new from a mistake, especially when it turns out better in the end! Those metal boxes for your silverware are a brilliant idea! Love all of the personality you’ve squeezed into this spot! oh, it’s lovely! and I adore your mix and match dishes (which would all be smashed in a million pieces in seconds flat at my house thanks to a certain baby ;)). Looks amazing dear! I think it was a good call to turn it around too because now there’s a clean line from the door down the island! Looks great! Your island is absolutely GORGEOUS! I love the story of how the top came to be – it sounds like that was a luck mistake, because the patina of the wood is just perfect now! Love love love those stools too! 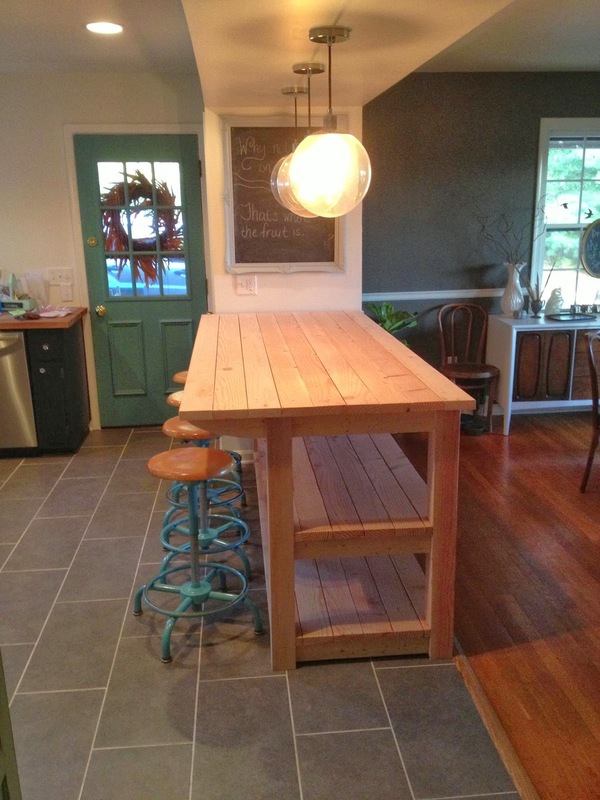 those stools make me drool a little…but the island is the real star!! looks great, and i love the way you styled it too! I’ve always loved that Island. I wish I had your neighbor here, I need one of these! That’s a happy accident! It turned out so nice!that tile is going to look great too! I think this is onw of my first visits to your blog and boy did I pick a good day to stop by! I adore your kitchen island and all the storage it provides and all your rustic charm 🙂 oh and those pretty dishes too 🙂 I just recently painted the inside of my laundry room door a pretty aqua which is very similar to yours, so of course I smiled when I saw yours! Oh how you hopefully know I love your style…and those stools!! But this island is perfect. First thing I noticed is…genius…it has lots of storage! I am all about functionality and looking good!! I love how it all turned out and it looks amazing. Love the way it turned out, CAssie! A happy accident, I think! Every post about this kitchen makes me so happy. It is coming out awesome & when you posted the pic of the tile on fb the other day I think I gasped out loud! The island turned out fantastic, but I totally know how you must have felt getting it to that point!!! Looks great. I like how you switched the stools to the other side. Great job! In love with this! Makes me wish I didn’t have an attached island! Beautiful tile that you’ve chosen! When you showed it on IG I immediately thought of the ocean, too. Can’t wait to see it installed! The island is wonderful. What a talented neighbor you have. 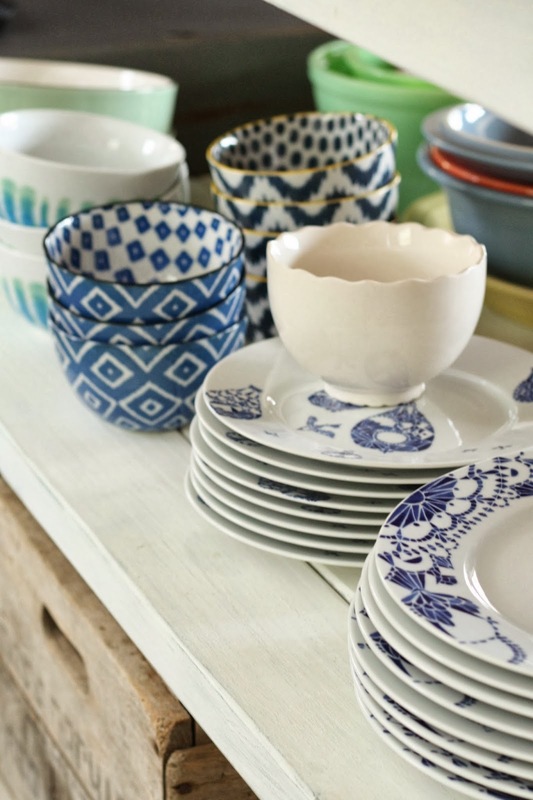 So fun to have the open shelving to show off your lovely colorful dishes. The top is beautiful Cassie! I know I’ve said it before but it is fun for us all to see you transform your home! You have done so much. 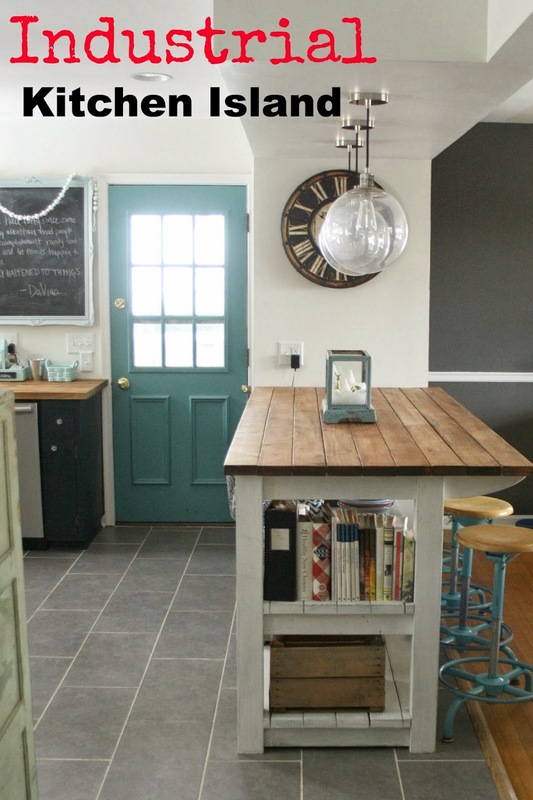 Love the island Cassie and those stools! It definitely looks better on the other side. 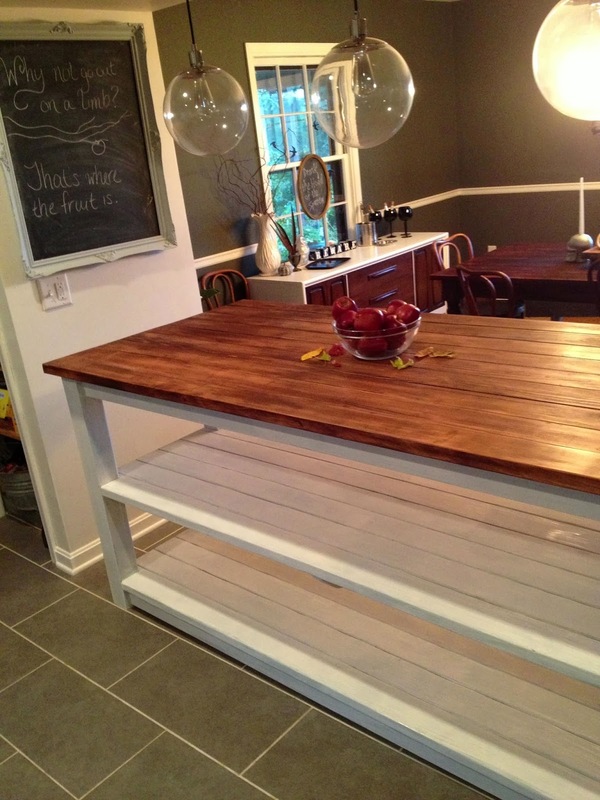 WOW that is an awesome island and I love how you achieved such a perfect patina even through trial and error. Ehem… we have all been there. So great when it has such a great outcome. Looks so great Cassie! You have such a great collection of bowls!! It seriously could NOT be prettier! And that tile? I feel faint, yo. Can’t wait to see how gorgeous it is on your wall!!! The island is a-mazing and so are those stools!! The tile is gorgeous. I love The Tile Shop. We’ve gotten all of our tile from there. Love it all, Cassie and well worth the wait! I love the rustic, worn look it has. All of the details you have added to the island make it even more special. Great job! Oh, and I love the tile choice, too! You’ve captured the perfect mix of functional, unique and charming, my friend!! LOVE the impact of the stools and it’s going to be crazy awesome with that tile!! I love the old drawers. They add a nice grittiness. I feel like sometimes my accidents end up turning out better than plan and that is certainly the case here. That island is amazing and hey I was sorta right about you making it, you of course painted it! Oh and don’t get me started on those stools!!! Perfection! When I viewed your home at Christmas time, I noticed your island. Very cool. Open shelving is my favorite. Great job to you and your neighbor. I have messed up with a big table top like that before and it was not fun to get it right. Turned out perfectly here for you! Oh I love it Cassie!! And even more so when it worked out from an unintentional mistake…if you had planned that look, you never would have created it by trying. Gotta trust, hey?! Oh I love it when a mistake makes it perfect! It looks lovely! I am crushing on your stools and your pendants… where did you get the pendants? I love how much storage it gives and how you now can have people at the counter while you dance and occasionally cook! Cassie, what a blessing in disguise that the top didn’t come out right the first time….because the end result is gorgeous!!!! I love all your open storage and seating that this island provides. It looks beautifully built and the way you finished it is so custom and perfect for your home. Can’t wait to see that amazing backsplash next!!!!!!!!!!!! You know I am dying over it, it’s just like the ocean, I love love love it! oh I love that tile!! gorgeous!! That island is pretty amazing too! loving your island Cassie. It is perfect for your space. You’re so lucky to have such an awesome place to put this piece. Your accidental color is fabulous too. Wow. Just wow. It truly looks like it was meant to live with you. And the finish is gorgeous. Also, That. Tile. Is. Amazing. I love that stain color! It turned out perfect! Such a great statement in the kitchen with some seriously awesome styling too! oh my gosh. you are amazing. Love love love!! those stools and the terrarium are INCREDIBLE!!!! love it all! It’s just so amazing amazing dreamy amazing. Can’t stand it, it rules so much! Oh – and if you ever sell those stools I will kill you. The end. It turned out pretty fab! I love how pretty the open storage looks. The whole kitchen is really looking lovely; you must be so happy with it. Everything about it is drool worthy! I love your stools too! I knew I was missing out on fabulous stuff by being away from my favorite blogs for so long! This is such a killer piece of furniture. Yea for perfect accidents! It couldn’t have turned out any better 🙂 Your styling has me going ca-razay!!! You’re so good! Found this on Pinterest. GORGEOUS! Love your kitchen and the island is just dreamy. I like the way you’ve arranged the shelves. And those stools … love ’em!! Oh my goodness I LOVE this. This is exactly what my kitchen needs. I am so glad I found you on pinterest. I have been trying to explain to my husband what I am thinking between our kitchen and dining room. It means removing part of a wall first but that is easy right?? I can’t wait to show my husband because he needs to see examples and this is perfect. I just love it. Off to check out more of your cute blog. Cassie! I know this is super old, but I stumbled on the post from a search for aqua stools on pinterest…and WOW! Everything looks incredible! 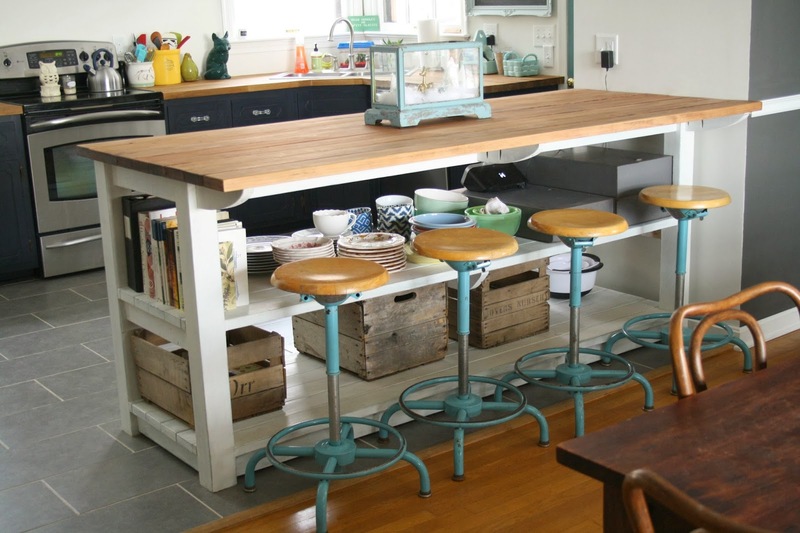 The island is awesome, and those stools…drool. Well done, girl! thank you so much, abbie! i appreciate it! 🙂 i am really happy with how the kitchen has come along! Looks amazing, what kind of wood you used for the top? Thanks a lot, i am putting something like yours together and really liked the top, i used pine as well, vinegar and steel wool for colouring and finished with homemade beeswax.. I LOVE your island! What are the measurements on it?? We have a rather large space and will be building a custom island as well. I really like the simplicity of yours. hi beth! you can contact travis at middlecreekwordworking.com – he has all of the info on it! thank you! Um, love this! Any clue who the manufacturer of the stool is? I want some like this but with a high back. Thanks for your help! ok i just flipped them over and it is “adjustrite”. 🙂 good luck! I was looking at your gorgeous island. I love the style and all the seating it provides. The stools are amazing. We have looked for something similar. Your tile is a beautiful color choice. To me it looks like you are trying to bring sea colors in. 9 times out of 10, the bloggers and their stores are half way across the country. You are close! Frederick!! I am a bit south but I am psyched because I can check out your store. Yeah! You have great taste! Look forward to now checking out the rest of your blog! oh awesome! we are open the third weekend of the month (today being the last day this weekend- so next up is june!). look forward to meeting you! and thank you so much! my dining room has a wall of seascapes… yes, i love the sea! I love LOVE this! Can you tell me the dimensions for this island? hi! it’s 38″w x 88″l x 38″h. Hello! You don’t happen to have measurements or blueprint for this island do you? If you posted any I haven’t been able to find them. I love this and want to build one for my kitchen. hi jeremy! my neighbor has the plans and i believe he sells them. he can be reached at twbruns@gmail.com and his name is travis. thank you!